Grins and thumbs-up signs began a press conference to announce that the Huygens probe had landed successfully on Saturn's largest moon. "There will only be one first successful landing on Titan, and this is it," said Alphonso Diaz, NASA associate administrator of science, at the press conference in Darmstadt, Germany, today. Today, after a seven-year journey the Huygens probe successfully descended through the atmosphere of and landed on Titan, Saturns largest moon. This is one of the first raw images of Titan from Huygens. Image courtesy of ESA/NASA/University of Arizona. Huygens separated from Cassini on Dec. 24 and began floating around Titan (see Geotimes Web Extra, Dec. 17), with its actual descent beginning early this morning. Preliminary reports suggest that the probe took 147 minutes to descend through Titan's hazy atmosphere before it landed on the surface, said Jean-Pierre Lebreton, Huygens mission manager with the European Space Agency (ESA). All three parachutes appear to have deployed correctly and the descent only took a few minutes longer than expected. About four minutes into its descent, the probe began transmitting data to Cassini, which then relayed it to Earth with a 67-minute delay. The probe continued to transmit data after landing  extending the probe's expected lifetime  which was a pleasant surprise for the scientists. 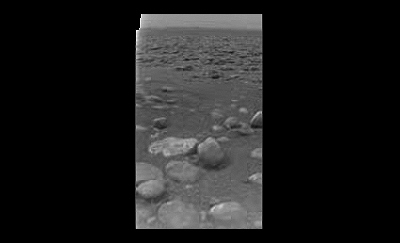 Huygens was designed to capture images and data from Titan's atmosphere. Scientists had not expected any contact after landing. Part of the reason Huygens may have survived on Titan longer than expected may be that the probe is encased in a thermal outer-layer that keeps the probe itself at about 25 degrees Celsius, Lebreton said. Huygen's batteries could last up to seven hours after landing, Lebreton said, but Cassini will only be able to capture data from the probe for about 30 minutes before it will lose connection. 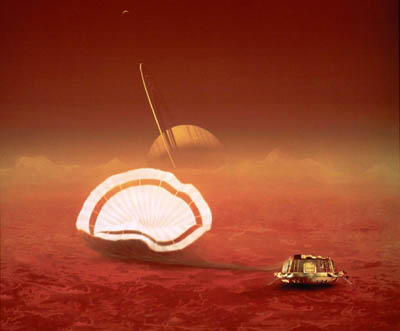 This is an artist's rendition of the landing, which scientists speculate occurred on land rather than liquid. Image courtesy of ESA / D. Ducros. The fact that the probe continued transmitting data after landing could mean that it landed on land, rather than in liquid, Lebreton said, but it is really too early to tell. Data and images of Titan's atmosphere or surface are just starting to reach scientists on Earth. They expect much more data and many more images later today and throughout the coming days and weeks. "We are now eagerly awaiting the scientific results," said David Southwood, director of ESA's scientific program. The data will be pieced together, analyzed, and undoubtedly argued about and debated by scientists now, he said. "This is a major step forward, but this is only the beginning." One of the primary reasons for exploring Titan is that its atmosphere and surface are suspected to be most similar to early Earth's and will hopefully help scientists understand what ancient Earth may have looked like.